My gauge problem remains and ubi tech support insists it's a gameplay issue...so I was wondering if someone here could either tell me how to make screenshots of battles or point me in the right direction. Edited by Tsar-Ivor at 03:07, 21 Jul 2012. You press F12 or Print screen, then paste the image into paint. What for paste them? 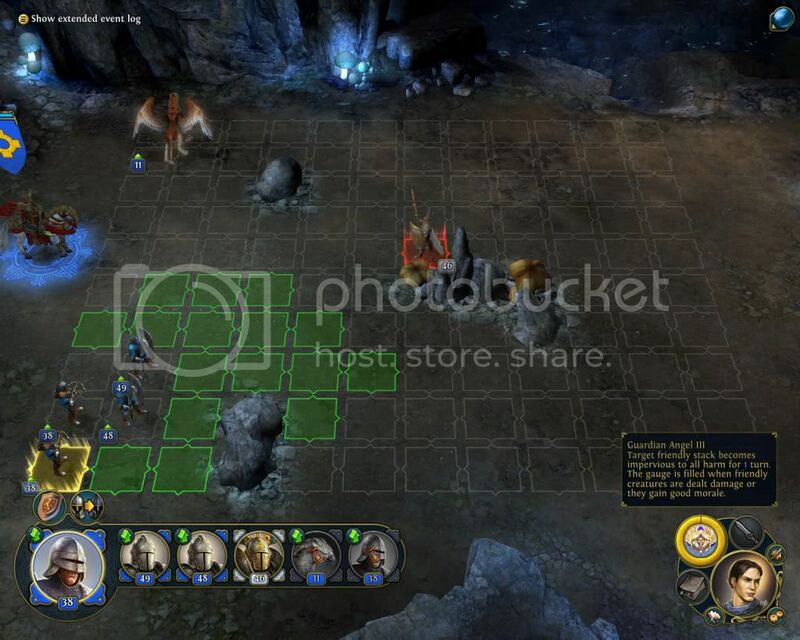 They are in Documents/Might and Magic Heroes VI/Profil Name/ folder. Maybe there's something I have to enable first? Edited by Elvin at 23:25, 21 Jul 2012. Can anyone tell me how the AI is in this game? Heroes VI? Honestly, any improvement over Heroes V(outside of campaign, which is scripted)would be significant, but I'd like to play more skirmish maps that are not timed and such. I'd say it's in between. Not really good, not as horrible as H5 either. After you print screen, exit the game, open paint and use the paste function in the open space(or use ctrl+v). The screen will appear and you can then save it on your desktop. Thanks, Elvin ...I was able to do it now. I would like to post the screenshot and see what you guys think before I submit it to Ubi tech support. Maybe it is a gameplay issue, but I doubt it. How do I post an image here? Upload the image in a site like photobucket and post the link between [img] and [ /img]. Can anyone tell me how offline and online saves connect? I had to reinstall my game and it didn't patch right up to 1.5,but instead it patched in small steps. The conflux didn't connect to my game until it was patched to 1.5(is that even normal? ),but I did start a small map,even with the 1.0.-version and saved the game and the safe was still there when I started to patch my game,until it reached 1.5 at which point the conflux connected again,but my safe from 1.0 disappeared. The initial post talks about better connectivity between online and offline saves,so is there a way to get my safe back even if I'm connected with the conflux? Not yet. There was an entry in the news sticky, that will be patched in soon. Correct me if Im wrong but could it be, that the Inferno magic tear ability - Seal of Power is bugged or dont work as supposed? I made the the experience that it heals not that much as stated in the description. Is something like that already known here or should the Seal of Power be fine? Edited by KingImp at 18:21, 22 Jul 2012. Does anyone know whatever happened to towns having specialties like we did in H3 (I think) and H5? I don't remember where, but back during development I am almost certain I remember them saying it would be in the game. Is this yet another "casualty of war" that suffered at the hands of Ubi's underbudgeting or is there another reason why this didn't make it in? So, here's a screenshot of a battle using a lvl30 blood/might Anton. This is the first battle in the blood final campaign. As you can see the gauge is completely full but it still shows the racial ability as III. The same thing happened with my tears/ magic Anastasya and my tears / might Sandor. With Irina (tears/ magic) it was worse: her gauge capped at lvl II. With Kiril it worked normally. Does this seem like a gameplay issue? If so, what am I doing wrong? I'm alsmost Certain that there were no Town special abilties in Heroes III only in Heroes V.
Well, Erwan was asked about it during Fanday and he said, that developers very regret that this feature isn't in-game. I don't remember details unfortunately, so I can't get you his full answer but his first reaction on question "Where are town specializations?" was: looking around on both Limbic and Ubisoft guys and asking them "Yes, where they are?". IIRC it was another feature which was sacrificed during development process but as I said, I don't remember his full answer, so I can be wrong. From my personal impresion during this interview, I think there is a small chance that they will came back one day. Edited by BlueLore at 12:15, 27 Jul 2012. So what is known about it at the moment?Can we expect it to be included in 1.6. or something like this? Are you talking about individual buildings for the towns? If so I think that it was most likely included through those optional buildings,where you have to choose one of two. Edited by KingImp at 16:13, 27 Jul 2012. No, I'm refering to the towns themselves that gave certain bonuses. Whether it be an extra creature per week, or stronger tower defenses, or an extra resource per day. We had that in H5 and I'm almost certain we were supposed to have it in this game as well. well I don't really see the big difference between these buildings and the unique buildings,where you have to choose one,except for the fact,that the unique buildings give you different bonuses than the ones you've listed. But anyway,the necropolis does have such a building,since it has this building where you can rerecruit dead heroes. Other factions only have an artifact merchant and the inferno does only have a special mart if I remember correct,I think every town should have an artifact mart and another unique building. I always get the archievement for the unstoppable general(winning with the main hero in a row). But I think I am never getting any dp for that,so whats the deal with that. This Achivement has been bugged until patch 1,5,2 (now works fine for me). The bags were various. Sometime the counter restarted when new patches came out. In 1,5,1 the counter restarted every time you lunched the game. But as all bugged achievements, you only get the bonus points for the firs time you finish it. Every time it restarts and youmanage to fulfill it again you only get the notice not the points. It would be an even worse bug if this would give the player infinity of points. This means that you are not getting the points because you have already finished this achievement some time ago, but the bug has cuased your counter to restart. But the Elite Archer achievment does not sitll add up for me and my stronghold. Either you never made a map in H5 or you are confusing what I'm referring to. These town bonuses aren't something you built like a dwelling. It was an automatic bonus based on the town's name. Each one had a different bonus attached to it. Granted, it was random in most maps, but if you made your own map, you could specify which town you wanted to start with based on it's bonus.